It’s a haunting melody that fills a few of the newest Final Fantasy XV trailers. Starting out softly, Florence + The Machine’s cover of “Stand by Me” is the perfect song for the latest entry in the Final Fantasy franchise. The lyrics about the strength of bonds enduring through everything mesh extraordinarily well with a classic sounding rendition of Final Fantasy’s well known “Crystal Theme” strummed on a harp. While it may be unusual to hear a cover of a popular song in a Final Fantasy game, it immediately sets the tone and sends the right message. Director Hajime Tabata is attempting to do things a little bit differently with Final Fantasy XV, hoping to attract new players while pleasing loyal fans who have waited a long time for the series to be a challenger again. The combination of a well known song with a distinctly Final Fantasy styled orchestration is the blending of these ideas. I get chills every time that trailer plays, watching Noctis and his friends interact as the orchestra swells with purpose. We see scenes of playful banter, working together, and even saving each other’s lives at the risk of their own. 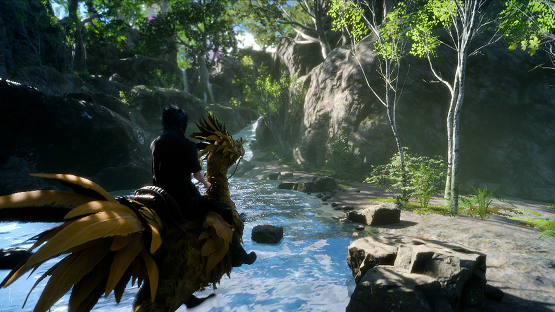 And that was all just in the first trailer of the day at Uncovered: Final Fantasy XV. There was a lot more to come. Square Enix has gotten a bad reputation among many fans over the last decade. They had a habit of announcing too early, showing too little, and being altogether too corporate in their public approach. No one would have blamed you if you thought Uncovered: Final Fantasy XV was just going to be a few trailers with hardly any real information besides the release date. No one could have guessed what was coming next. Greg Miller and Tim Gettys took the stage, one having hardly touched a Final Fantasy, and one being a super fan among super fans. And Square Enix let them have fun. Miller took a few jabs at the developer’s past missteps and Gettys rightly geeked out all over the stage for every piece of Final Fantasy history (Sorry, Greg! I fall in the Tim super fan camp here). The conversation was designed to include the audience and was presented in such a way that Miller and Gettys felt like avatars of the crowd, rather than presenters. It was a relatable approach, indicative of Square Enix reinventing the relationship with their fan base. And they announced more than we could have hoped for. Brotherhood. Kingsglaive. Justice Monsters Five. Platinum Demo. Along with the main game, these make up the Final Fantasy XV universe, and series of extended media that tell additional stories without expanding to multi-game development or taking anything away from the main game. Oh, they may have tossed in the release date (September 30th, if you somehow missed that one) and teased the car taking off and flying. Though after three teases, they never revealed what actually happens when Titan punches the ground. Guess they have to maintain some secrets, right? Before the event happened publicly, I had spent the day learning about a few of these announcements, playing the Platinum Demo, and of course the highlight of day, talking with each of the directors for Final Fantasy XV and Kingsglaive, Hajime Tabata and Takeshi Nozue respectively. Sitting down with Tabata-san and Nozue-san, I could instantly feel their energy and excitement. Despite the language barrier between us, the hour-long interview by way of a translator (the awesome Gavin Poffley) felt more like a conversation between friends. Tabata knows that this day has been a long time in the making. His smile gives away his eagerness to talk about the project that he’s not only developed, but reinvented after more than five years of failed starts and rocky development following its announcement as Final Fantasy Versus XIII. The interview wasn’t one to unveil a lot of secrets (the event did a perfect job of that on its own), but it was a great time to get a good feel for how they were approaching the project creatively, and Tabata’s overall vision for what Final Fantasy XV has become. “We wanted to make it easy for people who aren’t traditional Final Fantasy fans to be absorbed into the world, to get into that world and start enjoying the game…” Tabata talks about grounding the game in a more grounded aesthetic using modern day technology and industrial art style alongside the conventions of fantasy such as magic and weird creatures. He points out that even the summons in the game, while over the top and huge, have an element of believability in the way they interact with the world. It’s this approach that intrigues me the most. The last time we saw this kind of manner of introduction to the world — starting with something that was grounded a bit more in believability — was Final Fantasy VII. Tabata comments on the success of FFVII, but makes hit clear he’s not trying to emulate that game directly. Rather, he’s trying to make a game that could evoke the same kind of success and emotion on its own, and perhaps even achieve the long remembered status being the first Final Fantasy game that modern gamers pick up, the same way that VII did for gamers 20 years ago. 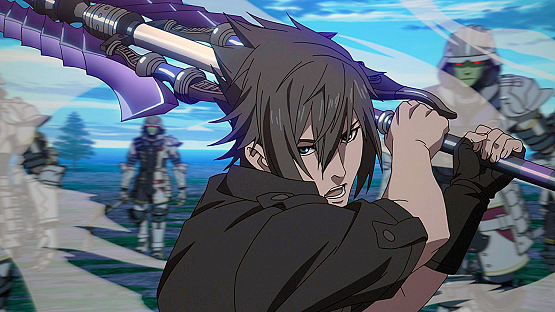 The end of the long road to Final Fantasy XV’s release is in sight. Tabata wants to make sure that the last 10 years of waiting pay off by not only listening to the fans, but giving us more than we could have imagined. And despite how massive the Final Fantasy XV universe has now become, the story retains an intimate closeness by focusing on the bonds between the characters. Noctis and his three friends are close, and the journey that you share with them may be one of ultimately saving the world, but it’s the bonds of friendship that matter most. They matter so much that it was worked into the very mechanics of the game. The AI of the characters, they way they fight in battle and the way they interact with one another was specifically designed to offer depth and personality as opposed to just general AI characters or seeing the relationships play out during cutscenes. It was important to Tabata that this be a core part of the game from the ground up. He’s confident that the game doesn’t need that phase, and wants the strength of the bonds to have already been established, though he does realize that people like to see that side of things, and that’s when it was determined that an anime miniseries could depict the building of their friendship. 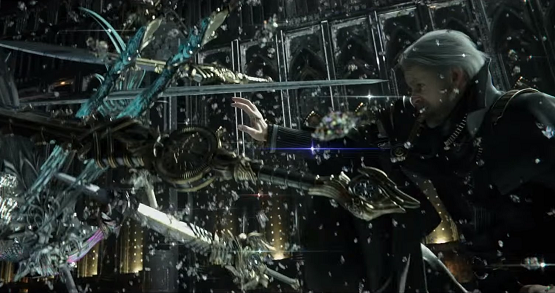 In a similar vein, the CG movie Kingsglaive was thought to be a great way to expand on the story of what is happening with King Regis concurrent to the events of Final Fantasy XV without sacrificing anything from either narrative. Of course, Justice Monsters Five is more about connecting the player to the world when they are away from their console, being Final Fantasy XV’s minigame that will also be available on mobile. And the Platinum Demo that is now available is a technical showcase of the graphics and game systems that also offers an exclusive summon in the final game if you complete it. The ‘universe’ approach isn’t new. In fact, it’s quite popular in media today. One has only to look at the Marvel Cinematic Universe to see the kind of success that can be garnered by creating standalone pieces within a shared world. It’s a way to build anticipation, immersion, and keep people coming back. It’s nothing new in video games either. Specifically with Final Fantasy, we got the Compilation of Final Fantasy VII, collecting a series of prequels, sequels, and side stories into a variety of media platforms. In some ways, Final Fantasy XV is reverse engineering that idea and presenting it in a whole new way. 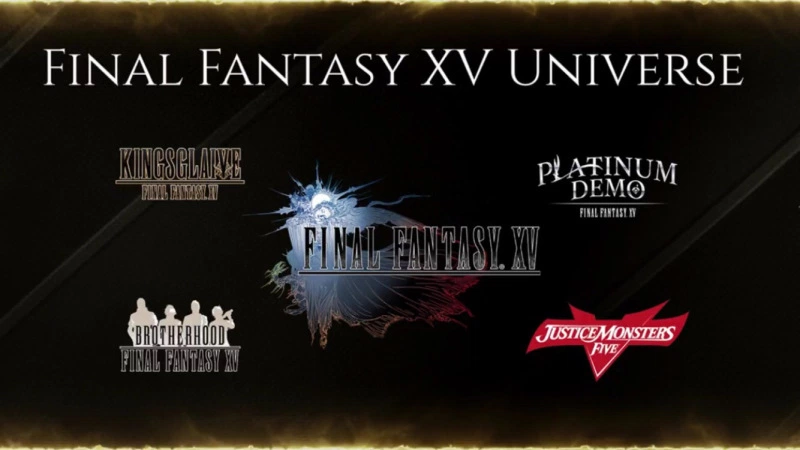 Instead of being long after the fact, Final Fantasy XV’s expanded universe will actually arrive before the release of the main game. It’s a way to drip feed fans and newcomers alike, keeping us content until September 30th comes around. Tabata-san says he’d like to eventually consider doing something big enough that they may need to cooperate with another company outside of Square Enix, but far from confirming anything, for the time being he just wants to focus on getting Final Fantasy XV to its long awaited release date. It was an honor to have Square Enix include me as a part of such an event. It held a lot of personal meaning for me. While I had been gaming long before Final Fantasy VII’s release, it was the game that made me realize that video games could be something so much deeper than high scores and toys. Like so many of you, or perhaps someone you know, Final Fantasy VII was the one that spoke to you on a different level. It may not even be your favorite Final Fantasy, but there’s still no denying the impact it had. Square Enix is looking to make that impact again. Not only for the game. Not only for the franchise. But for the entire company. Uncovered: Final Fantasy XV was about so much more than just showcasing the latest on that game. The subtext is that Square Enix is making a comeback and changing the very company we know to become more like the company we knew, and for fans and newcomers alike? That’s nothing but a good thing. A huge thank you to Square Enix for bringing me out to Los Angeles to witness Uncovered: Final Fantasy XV live and to have the chance to sit down with Hajima Tabata and Takeshi Nozue.